FulfilledProphecy.Com • View topic - Nephelim and The Watchers are back? Nephelim and The Watchers are back? so sorry about that. I was just innocently breaking wind then, out of nowhere, this ball lightning ignited it. Since this is not exactly prophecy related, I'm going to move this to the whatever section. Thanks! I can't seem to find the article, but I do feel differently... this is prophecy-related. Revelation speaks casually of angels flying through the sky and speaking audibly. Perhaps I shouldn't, but I take that quite literally. Now, so-called 'flying humanoids' -which I suspect are demonic beings- are being seen routinely in Mexico. Yeah, I think the Nephilim are coming back... and I would say that is a fulfillment of prophecy. Ok...how 'bout I move it to signs? YoungLion wrote: I can't seem to find the article, but I do feel differently... this is prophecy-related. Revelation speaks casually of angels flying through the sky and speaking audibly. Perhaps I shouldn't, but I take that quite literally. Now, so-called 'flying humanoids' -which I suspect are demonic beings- are being seen routinely in Mexico. Yeah, I think the Nephilim are coming back... and I would say that is a fulfillment of prophecy. Where exactly does Biblical prophecy dictate that the Nephilim will return? It doesn't, but since quite few folks believe that they were kicking around on earth in the day of Noah, it would make sense that they show up now in the days like Noah. For example, "As it was in the days of Noah..." You can cram a lot into that "As". The Bible isn't specific about whether the nephelem or the watchers would return, but like the previous post. The Day's of Noah....they were present, so why not now? So many people have lost touch with thier creator do to Darwin's theory, Evolution or anything else that tries to disprove God. What if the Nephelem and The Watchers return, but return as Aliens and U.F.O. which will enhance people belief that God doesn't exist. Wouldn't it be used as another tool for Satan to mislead people astray? I'm sorry, but whenever I hear about aliens and ufo's, I think back to images of "grey's"....and if they truly do exist, they have to be demons. I don't think anything of a holy nature would be that ugly, creepy, and terrifying. Some scholars believe that the sons of god referred to in Gen 6 means the sons of Seth and the daughters of men means the daughters of Cain. How they come up with that I do not know. In the book of Job the sons of God are definitely referring to angelic beings. And why would giants be born to the sons of Seth and daughters of Cain, who were both from Adam and Eve? Also remember it says there in that scripture, in those days, and after that. We know that there were giants in the land when David killed Goliath, who was a giant. I believe there is a lot more to it than most of the church has taught over the years. Jude definitely quoted the book of Enoch, which relates the story of the watchers. Yes I believe all of the UFO things are demonic and Satan is again trying to stop God's plan. Which was always his intent. Remember Paul says that we are wrestling against spiritual wickedness in high places. All of the technology here now and cloning and all of that has to do with Satan trying to prevent God's plan. And some of the things which many believe are myths about the Greek gods, etc. I do not believe are as much of a myth as many believe. Just like the Bible itself. Anyway, my husband, who is a believer, still does not believe the angels mixed with humans, but he is open to further study on it. That is what we all need to do and inquire of the Lord that we be open to His leading, and not just on what we were taught in church. The scriptures say we should not be unaware of the devil's schemes. Something to pray and study on. Actually the early Church and even the early Jews taught this very point, that some angels of God, rebelled and took human wives and the wives bore them giants. Jude also referred to this, when he said the Angels left their first habitation, but then compares it to sodom / gamorrah where people defiled themselves with strange flesh. Another point to consider is that if you actually listen to the teachings of these so called aliens it sounds alot like the teachings of spirit channelers that are channeling demons. Ladies, can you imagine giving birth to a giant?? Some scholars believe that the sons of god referred to in Gen 6 means the sons of Seth and the daughters of men means the daughters of Cain. How they come up with that I do not know. In the book of Job the sons of God are definitely referring to angelic beings. And why would giants be born to the sons of Seth and daughters of Cain, who were both from Adam and Eve? Exactly. It's illogical to conclude that the bible doesn't mean what is says and that usually has a lot to do with man's inability to understand the supernatural from a biblical perspective. I suppose, if an angel cannot come in the form of a man (despite the fact that through out the bible they repeatedly do come in the form of men) then how can we trust anything else the bible says? The only reference to sons of God in the OT are defined in Job as the angelic host. Man, did not earn the right to be called a son of God until either after or around the time of the ministry of Christ. 11 He came to His own, and those who were His own did not receive Him. When one is born again, he is born of God, and it is only then that he becomes a son of God. Also remember it says there in that scripture, in those days, and after that. We know that there were giants in the land when David killed Goliath, who was a giant. I believe there is a lot more to it than most of the church has taught over the years. Jude definitely quoted the book of Enoch, which relates the story of the watchers. Yes I believe all of the UFO things are demonic and Satan is again trying to stop God's plan. Which was always his intent. Remember Paul says that we are wrestling against spiritual wickedness in high places. Yea. We've become to intellectual for our own good and try to find an alternate solution for the plain simple teaching of the bible. I am certain that even today there are angels among us whom we have either despised or entertained at one time or another. I don't know. They come in the form of a man. It's likely they're probably isn't anything attractive about them or perhaps the opposite is true. The point is they are among us and whatever their purpose is for taking on such a form is a mystery to us. Jude tells us that several of the angelic host are bound up for the day of darkness, or the great day. These angels engaged in the same immoral sexual practice that prompted our God to judge Sodom and Gomorrah long before that incident took place. In Revelation 9 we see an angel with a key unbind these angels to let them loose on the entire earth as a judgment from God. Yea. I have a question about cloning. If it is God who is the creator of man and who creates the soul in the womb then who or what exactly is going to animate the corpse of the clone? I would add that I think there is more than meets the eye in the 'as in the days of Noah...' allusion. There is considerable depth in that statement... worthy of many Bible studies! Jesus may have been referring to a lot more than just sin. I was always taught that Noah was chosen because he was a good man that found favor in G-d's sight. I'm told that the Hebrew word (tamiym) used to describe Noah, however, has a connotation of special physical purity normally reserved for sacrificial animals. More than just being a nice man, was Noah possessed of special genetic purity which might have led G-d to choose him to survive and help fulfill the redemptive plan? It seems Satan had quite a breeding program going on at the time in an effort to prevent the incarnation that he knew was coming. I think that may still be part of his plan... perhaps in an effort to confound and pervert the world in the time remaining. Yeah, I think these beings will pass themselves off as ETs that "evolved" elsewhere and the world will buy it. Maybe it's wrong to say that they're returning. Perhaps they never really left. Increased activity, though, seems to be a fulfillment of what Jesus said was coming... and certainly a sign of the times we live in. They know they don't have much time left... so they're getting busy again. The ET/UFO belief system is becoming increasingly mainstream. If you declare disbelief nowadays or assert that they are actually demons you get goofy looks and laughter. That's quite different from the public mindset of years past. The extra- biblical book of Enoch has a lot to say on this subject here's a link if you want to read it. Though not included in out bible, it is very interesting. I'm not sure about the history of this Book or how accurate it is. But the verses in Jude are quoted from Enoch. Since we would all carry a recollection of such beings -if they existed- it's sort of interesting to look at parallels in other religions/cultures. Our Bible refers to the Nephilim as 'gigantes' and -although many were giant- that Greek term is more accurately translated as 'Earth-born'... an odd phrase for ancient people to use. The Titans, Greek gods and goddesses, were partly terrestrial and partly celestial beings. Were the Greeks remembering the Nephilim? The Greek word 'titan' is related to the Chaldean 'sheitan,' which correlates to the Hebrew 'satan.' Pretty creepy. I got curious and wondered what Islamic and pre-Islamic cultures "recollected." Everyone seems to have a story that links up with the Nephilim. I think that one day they'll land on the White House lawn in some kind of ET/UFO charade. The jinn are said to be creatures with free will, made from 'smokeless fire' by God (the literal translation being “subtle fire”, i.e., a fire which does not give itself away through smoke), much in the same way humans were made of earth. According to the Recitation, jinn have free choice, and Iblis used this freedom in front of God by refusing to bow to Adam when God told Iblis to do so. By refusing to obey God’s order he was thrown out of the Paradise and called “Shaitan” (See Shaitan). In the Qur'an, jinn are frequently mentioned and Sura 72 of the Qur'an named Al-Jinn is entirely about them. Another Sura (Al-Naas) mentions the Jinn in the last verse. In fact, it is mentioned in the Qur'an that Muhammad was sent as a prophet to both “humanity and the jinn”. The jinn have communities much like human societies: they eat, marry, die, etc. They live in tribes and have boundaries. They follow the same religions as humans do, and follow the same ranks in armies as humans do. Jinns can settle in a vast area to a tiny hole, as they are massless and can be fit into any space they find sufficient for them. They are invisible to humans, but they can see humans. Sometimes they accidentally or deliberately come into view or into contact with humans. Jinn are believed to live much longer than humans: some of whom are said to be still alive have seen Mohammad (a 7th century person), which verifies their long age. Much like humans, djinn have learned to assimilate into the human world when they desire to do so. In many cases they live unnoticed among people marked only by the rather unusual or somewhat secretive practises they keep. They may breed with humans and their descendants may or may not have some or all of the powers attributed to the race of jinn. One power that all of their descendants seem to keep despite dilution of their bloodline is invisibility. Jinn can transform themselves into humans and can be summoned by humans. In Islam, humans attempting to perform black magic on humans call Jinn specializing in dirty deeds to perform the magic; such black magic on humans can only be undertaken by dark Jinn - “Ifrit” or “Marid”. In many Islamic countries there are people who perform or supposedly perform black magic (usually for cursing other people, or using jinns to influence a marriage to end in divorce, etc) in exchange for money. Thus, a person often pays a magician, who then calls upon a dark djinn, who then performs the magic, at least supposedly. In Muslim beliefs, the genie can also act as a supernatural thief. By some traditions, Mohammed warned against thieving jinn. This is very interesting, I came across it while looking for other things on wikipedia!! The legend of Red Horn (also known as 'He Who Wears Human Heads as Earrings') is found in the oral traditions of the Ho-Chunk (Winnebago) people and was recorded by anthropologist Paul Radin around 1900. The saga of Red Horn depicts his adventure with Turtle and Storms-As-He-Walks (Thunderbird) who fight a race of red haired giants that have been killing Red Horn's people. Red Horn eventually took one of the giant women as a wife. There is some speculation that this race of giants were actually medieval Norse invaders to North America, presumably the same as were responsible for the (disputed) Kensington Runestone. The theme of red haired giants clashing with a culture is also common among the vampire lore of Asia and the apocryphal Book of Enoch. The Kabbalah is a system of mysticism which originated in ancient Sumer, thus putting its beginnings in the same remote epoch as the mysteries of Egypt and the Hindu Vedas. Babylon succeeded Sumer, and transmitted the teachings in turn to the Hebrews, along with many other elements of their religion, which are therefore still familiar to us today from the Book of Genesis. The word "Kabbalah" comes from a Hebrew root meaning to receive sacred teachings. The Jews added two important works to Kabbalistic lore, namely the books known as the Sepher Yetzirah, reputed to have been written in the 2nd century AD, and the Zohar, dating from the 13th century. The Zohar came to the attention of Christian scholars shortly thereafter, and sparked an interest in the Kabbalah on the part of a wide range of European mystics and occultists. Thus the Kabbalah became part and parcel of the secret teachings of such groups as the Rosicrucians and Freemasons. The Sumerians were the first to invent the wheel, use multi-leveled dwellings, have a type of printing press ( cylinder wheels ), have a court sytem, and many other inventions. There was NO precedent for "civilization" prior to Sumer. Unlike the rest of history, where man learns from the past and builds on it, Sumerians had no one to learn from. Supposedly, they "just invented" all of this stuff from scratch. But if you look for some of the cylinder texts that have survived they attribute all that they learned from the "Annunanki". Annunanki, roughly translates to, "Those who fell from heaven". One of their chief "gods" was Enki. Mother - Ama in Sumerian, Ima in Hebrew. Father - Ab-ba, Ad-da in Sumerian, Aba in Hebrew. Sun - Shamash in Sumerian, Shemesh in Hebrew. In the book of Numbers, it calls the Nephilim the "children of Anak.” The word for giants in Hebrew today is Anak (singular) and Anakim (plural). According to the Signet "Hebrew/English Dictionary" by Dov Ben Abba, the word for giant can be "Anak" or "Anaki." Well how do you think you spell Enki without any vowels? Let's compare Anak and Enki without any vowels, they would look like this "ANK", "ANK." Lets compare the words Anaki and Enki without any vowels, they would look like this "ANK", "ANK." Let's compare the words Anunnaki and Anak without any vowels, it would look like this "ANNK", "ANK." All of these comparisons are matches of similar sounding words. Yes, the original source of the word for giant (Anak or Anaki) in Hebrew came from the Sumerian use of these words to describe their large gods. The Sumerian "gods" are the Nephilim or "giants" of the Bible. Did you ever notice that when a human came across an angel in the Bible, that he instantly recognized the angel? Do you think that, maybe, those headresses where more practical than normal crowns? That they are hiding something? Perhaps, the ancient myths aren't so far-fetched??? Thanks for all the follow up to my post. If you have not read the book of enoch, it is not a bad thing to do. Of course we are not certain that it is exactly as the early church had it, but I am sure that they had it. Also I remember years ago when I was searching where demons really came from and how they interacted with humans, I prayed and asked the Lord to help me understand. Anyway according to some demons are the fallen angels, but according to Enoch, the demons are the offspring and fallen angels and women. As God could not have their spirits return to him, as they were not meant to be, they were left to roam the earth until the end. I know I still do not have all of the answers but sure makes sense to me. Enoch also says that the fallen angels taught men to war and all sorts of things. Which makes me think that if as in the days of Noah there is a return why so much knowledge has come about in the past 100 years. Satan's intent was to delude the offspring of man so that the savior would not be born, and Noah was perfect in his genealogy. Paul also warned us to have our covering because of the angels, and he also says the church will judge the angels. Just some other things for thought. I believe UFOs are all about the return and cloning and all of that has something to do with it. And cultures have their stories of these giants and great heroes of renown. Satan has not stopped planning to overthrow God's throne and he intends to use mankind to help him for sure. Prayerfully and in His Name. Jesus Christ. OK, those are some seriously scary pictures! They look like the "coneheads" on the old Saturday Night Live TV shows. WhiteH2OWoman wrote: OK, those are some seriously scary pictures! They look like the "coneheads" on the old Saturday Night Live TV shows. That's what I was going to say!! Another good resource is Tom Horn. His books out are Ahriman Gate, Spiritual Warfare, the Invisible Invasion, and the Gods Who Walk Among Us -- all great reading. I just ordered his newest book, Nephilim Stargates, The Year 2012 and the Return of the Watchers. There's another series of writings, but I can' t find the link right now. From what I understood from the book of Enoch, is that the fallen angels' children where called the Nephelims, not the angels themselves. And because they where a mutated species, God did not include them into the salvation of human kind. So when they died, they became the evil spirits that where deemed to walk the earth. These are the evil spirits that Jesus brought out of people while he was on earth. So these spirits are still here. Maybe this is why there is so much turmoil in the Middle East. These spirits would still be around today!! I am having a very hard time connecting these together. Downpour wrote: From what I understood from the book of Enoch, is that the fallen angels' children where called the Nephelims, not the angels themselves. And because they where a mutated species, God did not include them into the salvation of human kind. So when they died, they became the evil spirits that where deemed to walk the earth. These are the evil spirits that Jesus brought out of people while he was on earth. So these spirits are still here. Maybe this is why there is so much turmoil in the Middle East. These spirits would still be around today!! Yep. And so many people don't understand there is a difference between fallen angels, and demons. They are different. In all my research I have done on this subject, I have NEVER heard this one before!! I don't doubt there were aborted fetuses, but I disagree on this interpretation, however I have nothing concrete to prove myself right at the moment. I'll have to do some searching. Just for the record, cranial binding has long been practiced by primitive cultures around the globe, so I wouldn't attribute those deformed skulls found in Peru or elsewhere to anything other than that. Thank you for posting that, Free...it does make me feel somewhat better. I guess it's like Japanese foot-binding, although why anyone would want to do any of it is beyond me. Hold on, I'm stupid. demons and fallen angels are different? How so? Luke 21:27 And then shall they see the Son of man coming in a cloud with power and great glory. Soul'dOut4God wrote: Hold on, I'm stupid. demons and fallen angels are different? How so? demons are the spirits left from the nephilim, the offspring of the fallen angels and humans. Their spirits are not God-given......they can't go up or down, they are stuck on this earth. They *need* a body...fallen angels don't need a body. Some sort of strange camera-angle illusion? Where did you find these pics? I do know that pics can be falsified but who knows? So where did you get these, huh? Note that after I posted the pictures, it seems to be a camera angle thingy. Thanks, even so. I believe the Bible is pretty clear. The Jewish people think that the sons of God, according to Josephsus, that it meant angels. And I for one think that if God meant the sons of Seth and the Daughters of Cain, he would have said it. Unless Cain was a giant that is, in order for it to be genetically possible I believe. When some of these pictures (the first two) were posted on CompuServe more than year ago, the majority of people assumed that they represented an example of binding of the head, well known to be in fashion in ancient Nubia, Egypt and other cultures. The problem with this theory is that the inside of the cranium of the mentioned skulls, although elongated and with a back sloping, flattened forehead, have the same capacity as normal human skulls; the only difference is the shape achieved by frontal and side deformations. They are actually more similar to the first type of skull (premodern) with the rounded back, than the conehead type. The cone-shaped types of skull are not found amongst the usual skull-binding samples. The first skull presents problems of its own. The frontal part of the skull seems to belong to an individual of the pre-Neanderthal family, but the lower jaw, though more robust than modern human type, has a modern shape and characteristics. The shape of the cranium does not have any comparison with the Erectus, Neanderthal types, nor the modern human type. Some minor Neanderthal characteristics are present, as is the occipital ridge on the bottom back of the skull and the flattened bottom of the cranium, other characteristics point more tovards **** Erectus. The angle of the cranial bottom is, though, unusual. We cannot exclude the possibility of a deformed individual in this case, but it is highly unlikely that the angle of the frontal part would require a modification of the lower jaw in the process of growing to resemble modern human types with their projected chin rim. The answer seems to be that the skull belongs to a representantive of an unknown premodern human or humanoid type. As is obvious from the comparison with a modern human skull, the cranial capacity lies within the modern human range. This is not surprising, since the late Neanderthals and early modern humans (Cro-Magnon) had larger cranial capacities (both roughly 1600 ccm to 1750 ccm) than modern humans (av. 1450 ccm). The decrease of the cranial capacity (sudden at that -- the specimens of modern humans after about 10500 BCE have smaller craniums) is a puzzling matter, but that's another story. No less puzzling is what a representative of a premodern human type is doing on the South American continent. According to the orthodox anthropology, this skull simply does not exist, because it cannot be. Textbooks' oldest date of appearance of humans in North America is about 35000 BCE and much later for South America, based on the diffusion theory assumptions. The only accepted human types entering the continent are of the modern anatomy. There are some other sources that place all types of human genus in both Americas at much earlier dates based on numerous anomalous finds, but the academe sticks to its preconceived notions, no matter what. It's safer. The problem with that argument starts at the source, an intelligent but misguided author named Lumir "Lu" G. Janku. He appears to be a New Ager, writing on topics such as Pharaoh's helicopter, ancient flying machines, mystery skulls, mystery skeletons, etc. I personally don't find his argument persuasive. Furthermore, it's interesting this person seems to have written quite a bit on New Age topics, and even hosts a variety of websites, yet there is virtually no information on the man that I can find. Perhaps he's using a pseudonym. Regardless, my personal feeling is that if an author is worth his salt and believes his views are well-founded, then somewhere there would be a biography on him. In light of the absence of any material that would lead me to believe Mr. Janku is a viable source of information, I can't take him seriously. So...You are telling me that in the ancient Egyptian drawing, the infant and the entire family practiced "binding"? 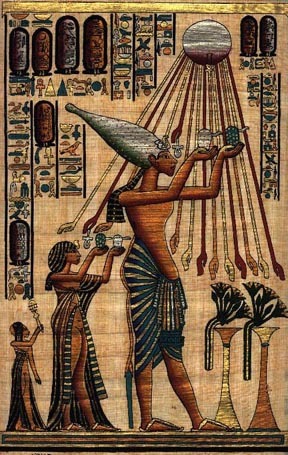 Can you show me any proof that such a ritual was performed by the pharaohs and their families? Dan 8:10 RV And it waxed great, even to the host of heaven; and some of the host and of the stars it cast down to the ground, and trampled upon them. This is why methinks angelic/glorified beings will be incarnated during the endtimes;good & evil. Just maybe, this passage is hinting at the nature of the two witnesses and other antagonists during the endtimes. There are passages in revelation as well. That is interesting. I would imagine to be God's witnesses, you would have to have seen him, and know him. Angels incarnate....that would explain how they could rise up in full view after 3 1/2 days dead in the flesh, and ascend to heaven. A full human would not be able to do that I don't believe. Indeed. I don't think Cain was a giant. But I do believe there were giants on the earth back then. I believe that also, because that is what the Bible and the Book of Enoch said. I know that Jude at least read and quoted the Book of Enoch so that makes it readable for me. Small God or little God? The God of the Bible doesn't need His people to be angelic beings in order to have them raise from the dead when He calls them home. Determine never to be idle. No person will have occasion to complain of the want of time who never loses any. It is wonderful how much may be done if we are always doing. Enlighten the people generally, and tyranny and oppressions of body and mind will vanish like evil spirits at the dawn of day. the son of Enos, the son of Seth, the son of Adam, the son of God.